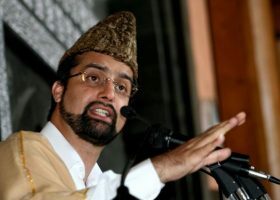 Hurriyat Conference (M) Chairman, Mirwaiz Umar Farooq on Monday strongly condemned the killing of a civilian, Shahid Mansoor at Shopian by ‘forces’. Meanwhile, Mirwaiz expressed grief and sorrow over the demise of prominent political figure of Azad Kashmir, Sardar Khalid Ibrahim who was the son of former president AJK Sardar Muhammad Ibrahim Khan, a close associate of Mujajire Millat Mirwaiz Yousuf Shah. Mirwaiz while praising Khalif Ibrahim for his farsightedness said that he was a great leader who earned name and fame by serving the people of AJK on all fronts in his four-decade long political career. He said Sardar Khalid always stood to his principles and never compromised on his stand on the Kashmir dispute. Mirwaiz prayed for the highest standards in Jannah for the deceased. Mirwaiz also expressed his serious concern over the huge losses caused to the apple and other crops on the both sides of the tunnel including Chenab Valley, South and North Kashmir due to unexpected snowfall and expressed sympathy and solidarity with the farmers in the present testing times.